Random Madness in Torrance: Where AREN'T they? 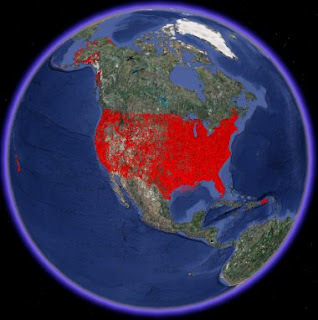 Google Earth mapped image of cell towers in the United States. Although I am a skeptic in regards to the dangers microwaves generated by cell phone towers may cause humans, there may be issues in regards to smaller, fuzzier, buzzier organisms. If you're concerned about the proliferation of cell phone towers, please sign the petition at CLOUTNOW, the Coalition for Local Oversight of Utility Technologies.